An artist painting at Warlukurlangu. The history of the Aboriginal art industry is characterised by unpredictable shifts in supply and demand. Art dealers first began to generate significant public interest in Aboriginal art in the sixties. Demand peaked in the early 2000s before meeting its maker in the financial crash of 2008. The industry painstakingly clawed back to its feet, but by the time it had straightened up and looked about, the landscape had changed irrevocably. Research by the Aboriginal and Torres Strait Islander Art Economies Project found that by 2012 art centre sales were roughly the same as they had been in 2004. But there was a catch: this revenue was being generated by 40 per cent more sales. The market had been flooded with small, middling-quality works which now constituted the vast majority of sales. The average price of a painting had halved. When I arrive in Alice Springs, it takes one day for the town morph from quaint to unsettling. One day, and the quiet streets lose their charm. Alice Springs runs on two industries: tourism and art. In the town itself, only the latter can be pursued. Barring a hundred-dollar day trip into the desert or south to Uluru, the endless parade of galleries lining Todd Mall is the only avenue left to bored visitors. Alice Springs is divided by the Todd River, which in its most shining moments is a series of puddles. At the town centre, west of the river, is Todd Mall, the centre of the art trade. R.M. Williams outlets, jewellery stores and galleries of varying quality line the curb, screaming for the attention of absent tourists. The town east of the Todd might be a hideously exaggerated caricature of white privilege were it not entirely accurate, replete with botanic gardens, golf courses and upmarket suburban houses nestled in superbly manicured gardens boasting not only plants, but carved sandstone. I have no idea what employment Alice Springs offers to support such upper middle-class luxury. 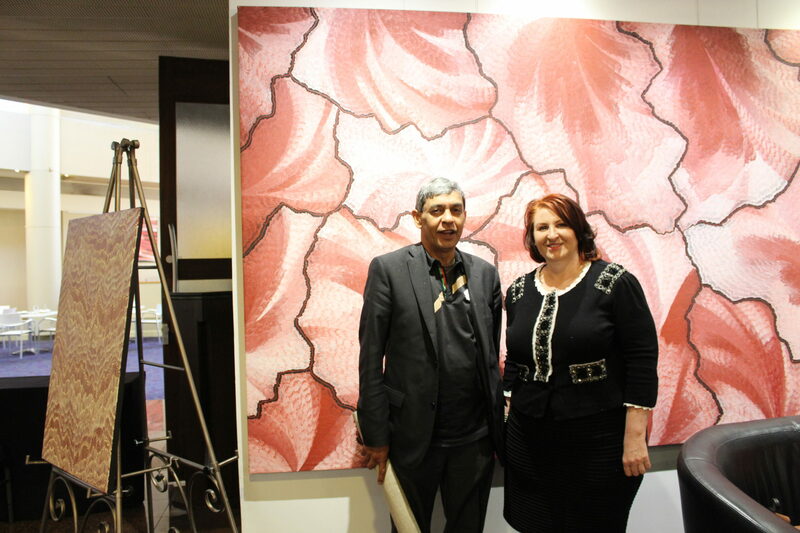 The gallery of Sabine Haider, President of the Australian Aboriginal Art Association, is housed in the Hilton Hotel. Sabine is seated on an armchair in the lobby when I arrive. She notes that I am late and that she’d wondered if I’d show. I am precisely one minute late. The man sitting across from her is quiet and hesitant, his face kind. Cameron, one of the artists whose work she purchases. Besieged with probing questions and rapt attention, Cameron’s timidity quickly dies. In moments, he is telling me that the government has ceded his traditional land of Ooraminna back to his people, the Aranda. They are eager to go back and start building a community. The government won’t help them build houses, however, and when asked why he gestures to his light brown arms, the result of his white and Indian grandparents. Even Cameron’s own uncle, the chair of the local land council, won’t offer his family much help in community matters. “I don’t know. Maybe,” he says. He doesn’t understand it. But a lot of people are like that. Cameron never wanted be an artist. He was once asked by a dealer asked to finish an artwork another artist had abandoned. Cameron claims his contribution was meagre at best, but the dealer encouraged him to continue painting on spare scraps of canvas. They were shocking creations, Cameron informs me. “Kindergarten-style paintings.” But his blobby kangaroo caught the eye of one dealer, who took it back to Tasmania, sold it immediately, and asked to buy anything else he produced. From that day, every one of his paintings has sold immediately. He cruised through the financial crisis without breaking a sweat as the industry fell to pieces around him. I ask him whether he thinks there’s a problem with exploiting artists. When pressed for a solution, Cameron names Yuendumu, a remote community 290 kilometres north west of Alice Springs. It’s home to a thriving art centre that produces not only paintings, but all kinds of merchandise: laptop covers, mousepads, Christmas decorations, all emblazoned with artwork. Royalties are collected for the artists whose work is reproduced. The next thing I ask about is forgery. Here, there are stories to tell. Cameron has an engaging manner of re-enacting two-sided conversations when storytelling. He used to work as a carer for an old Iranian artist, and he paints a scene for me in which he’s scrubbing this man’s back. “You are a good artist!” the man tells him. “Yes, you are very good too!” Cameron replies, still scrubbing. Cameron refuses, and the man orders him from the house. 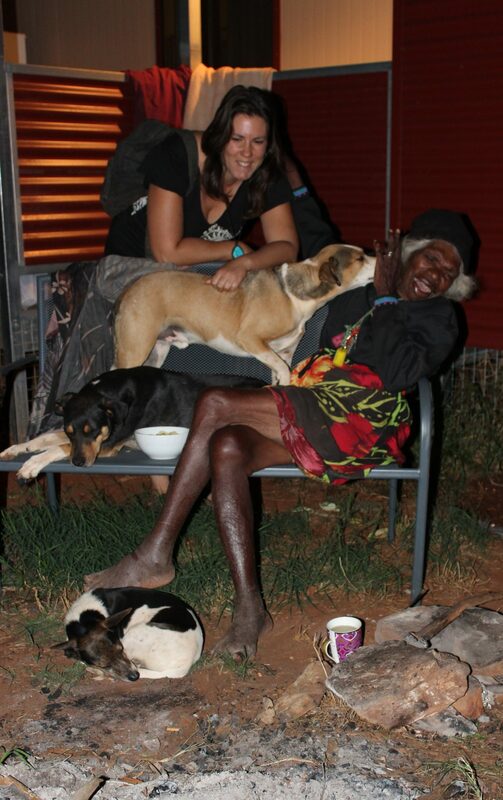 Next, Cameron is living in Darwin, caring for an old Filipino couple whose house is papered with Aboriginal art. He asks where they bought it. “No, we don’t get. My son!” the woman says proudly. Cameron assumes they must have adopted an Aboriginal boy. A photograph of the family indicates not. “Yeah, he’s so good, he’s just like an Aboriginal person!” Cameron is wry, and the woman is suitably abashed. She knows. Sabine returns from serving customers. She is dressed all in black, her blouse embroidered in sparking stones. Rows of pearls glimmer on her wrist. She speaks with all the confidence that age and experience can bestow. Like Cameron, Sabine fell into the industry when opportunity presented itself, this time in the form of a three-month stint at an Alice Springs gallery 30 years ago. The face of the place had been different then, the trade more prosperous, and Sabine estimates around 26 galleries had crowded the mall. It wasn’t the art itself that interested Sabine at first, but the manner of the artists’ treatment: the coarseness with which they were addressed by white dealers, how they were swindled, forced by circumstance to work for meagre pay. Though Sabine had lived in Alice Springs for many years, as a gallerist she saw with new eyes. Sabine spent the next decade studying Aboriginal art and its history. “You actually can’t [just] be a gallerist,” she explains, “you need to understand culture. You need to understand how the stories derive, you need to understand the people. And it really comes right back to Country again.” She worked at Utopia, a region northeast of Alice Springs famed for its art, and learned the women’s stories. The primary role of Australian Aboriginal Art Association, according to its President, is as an educator. Education is essential for those new to the industry who are often ignorant of the ethical issues and unsure of who to trust. I ask Sabine for a horror story. She describes a conversation with a tearful woman who had been swindled by a dealer in Alice Springs. He had waited until all other galleries were closed, then bartered cruelly. The woman needed to feed her family that evening. “So an artist I would have paid $200 got $25,” she concludes. She’d asked the artist to avoid that dealer, but choices are simple when there is no food on the table. The situation is exacerbated, she says, by the oversupply of cheaper art. The interview had begun oddly enough, but by its end we are fast friends. The three of us sit talking for another hour, our conversation wandering between remote communities, asylum seekers and mental health. A young girl, perhaps fifteen, interrupts us. “Do you know who painted that?” she asks Sabine, gesturing to a large painting that covers the wall behind her. Sabine tells her. The girl grins in delight. “That’s my pop,” she says proudly before hurrying away, still beaming. I sit with Cameron, listening as he tells me rapturously about Aboriginal customs and recounts Dreaming stories. He recalls the sacred places he’d seen, the inexplicable events they engendered, the indelible impression they left on his soul. He describes his home of Ooraminna, which holds the largest underground river in the country. Neighbouring tribes would visit for water. One of Cameron’s friends, a ninety-year-old man, claimed to recall visiting many years ago as a small child. Everyone had to be painted white, he’d said, before entering. “’I remember your mob,”’ Cameron quotes, pointing to himself proudly. Cameron shows me one of his paintings: three birds surrounding a white kangaroo, exquisitely rendered in fine dots. Birds he’d seen outside the window during a stint in juvenile detention. The white kangaroo he had glimpsed only once. It was an ill omen in his culture. You are supposed to run when you see one, he says, but he’d been convinced to go back to that place. He’d fallen ill immediately, coming out in dreadful boils. The doctors were confounded. Naturally Cameron’s story of the omen did nothing to alleviate this. A 2007 Senate inquiry into the Aboriginal art industry found ‘carpetbagging’ to be one of its most pervasive crimes. Carpetbaggers recruit groups of artists to paint for them, often in terrible conditions. They then underpay the artists in cash, food or alcohol, and sell with an enormous profit margin. The inquiry attributed the continued existence of carpetbaggers to two factors. The first of these was the circumstances of the artists. Many Aboriginal artists live hand-to-mouth, a reality attested by every person I spoke to. For this reason, they require upfront cash payments to support their families. The second reason was that cash payments and the universal unwillingness of artists to report unfair dealing left no evidence with which to prosecute carpetbaggers for a practice that is not strictly illegal to begin with. The outcome of the Senate inquiry was the formation of the Indigenous Art Code. Yet membership is voluntary and lack of legal bite renders its rules ineffective in practice. Come 7am on Sunday morning I am sitting beside a French girl, waiting in front of our hostel for the bus that would take us to Yuendumu. In true bush fashion, it arrives one and a half hours late. The bush bus takes five hours to travel from Alice Springs to Yuendumu and runs twice per week. We are the only white passengers. Small children swing across the aisle, chattering in a melodic language I don’t understand but close my eyes to listen to. One small boy, nose dripping with white mucus, presses his face against the window. It forms a slimy rope as he pulls away. The bus is blessedly air-conditioned to arctic temperatures. To my right the landscape is covered with spiky tufts and the skeletons of trees. To my left, rolling hills. I naively expect the undergrowth to give way to rolling dunes at some point. It stubbornly refuses. We pass through another community. A football field, entirely of red dirt. A school with one room. Two metal rocking horses sitting in a dusty playground, encaged by broken fences. By eight o’clock that unseasonably cool evening, I am sitting on the veranda at Warlukurlangu, Yuendumu’s famed art centre. Across from me is Olivier, a white-haired Frenchman in faded shorts, shirt and a battered cowboy hat. The stub of a hand-rolled cigarette is perched between two fingers. Olivier first fell in love with Aboriginal art at an exhibition in Paris. He prints the artworks on bangles, necklaces and rings before encasing them in resin. Before long artists were reaching out to him, looking to collaborate. He often uses the designs produced at Warlukurlangu and is invoiced the artists’ royalties. He is one entrepreneur whose business model is built on a commitment to fair dealing. Like everyone I’d met so far, somehow Olivier knows Judi. I tell him about my little investigation. All of us seem to be here at the art centre chasing a higher cause. Olivier’s son Alberto is tall, wiry and seventeen. Where Olivier’s speech is delightfully accented, his son flits between melodic French and a broad Australian accent. He makes rounds of the table, offering everyone back massages. There are several other French visitors, a Dutch girl, and a German man. I am the only Australian. Alberto tends to my back five times. Apparently, I am tense. As his son plants an elbow in his back, a cigarette dangling precariously from his lips, Olivier informs me he spent two years in a garage perfecting his method of printing on gold leaf. Our company demands to see these treasures. They are fetched, and occupy us for the remainder of the evening. Yuendumu is home to the Warlpiri people and has a fluctuating population of one thousand. It was the subject of sensationalist media coverage in 2015 when riots were reported as a threat to townspeople. I am told that said townspeople were largely unconcerned: one murder was committed as the result of a family feud. Yuendumu is better facilitated than most remote communities. It contains a medical centre, violence shelter, school, swimming pool, church, meditation centre, and Warlukurlangu. Community initiatives have been highly successful in limiting violence and substance addiction. Petrol sniffing has been nearly eradicated, and an alcohol ban is in place, for which only the Warlpiri elders can issue a license. The Warlukurlangu compound, like most buildings in Yuendumu, is protected by a high wire fence. The centre itself is walled on the outside with corrugated iron and adorned with colourful handprints. We wander in through the garage, past a detached trailer and a jumble of boxes, crates and discarded tarps heaped against the storage shed in a manner more haphazard than careless. Volunteer work at the art centre primarily involves looking after the artists’ needs. In this endeavour, we are directed by Fiona, a firebrand crowned with a mass of multi-coloured dreadlocks. My first task is filling a gargantuan teapot capable of boiling my own head, which swallows ten teabags and half a carton of milk in one brew. My second is mixing paints for Steve, who is sitting outside before a vast black canvas. He is tall, even while seated, and either more shy than myself or simply preoccupied. I set about my work, chattering noiselessly, too tentative to strike up a real conversation. He grabs the brown paint – I’ve made it too watery – and begins to somewhat clumsily spread it over the black. As I would later learn from Fiona, Steven has cerebral palsy. The fine dot work of textbook Aboriginal art is challenging for him; he is unable to move his brush in certain directions. As the day wore on I watched him dip his brush in pot after pot and splatter the contents violently over his canvas. Once, Steven was teased mercilessly for his disability. Now, Fiona tells me with relish, his unique style of art earns him more money than all his friends. I work up the courage to ask Steven for a photograph. To my surprise, he agrees. He even wants to see it. Cecilia Alfonso, the manager of Warlukurlangu, arrives the next day. As I silently spoon black paint from a great bucket, a woman with long dark hair swoops through the centre, plucking painted wooden Christmas decorations from their drying rack and throwing them down on the reception desk in agitation. This is the formidable businesswoman I’d heard so much of. I glance at the drying rack and sympathise. It’s true. 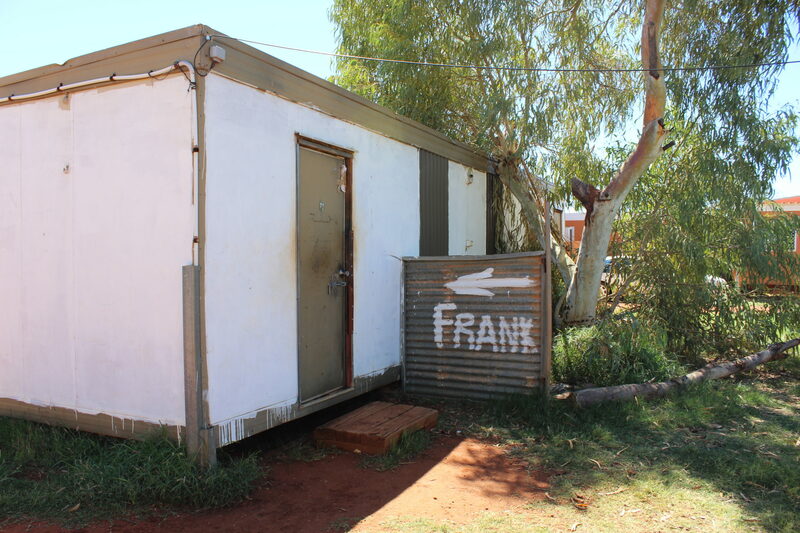 As night gathers I head to Cecilia’s house, the only two-storey house in Yuendumu. Her front door is open. I call out and let myself into the kitchen. From what I’ve seen of her abrupt manner I suspect she has no inclination of waiting on me. Sure enough, at first Cecilia doesn’t acknowledge my presence when I enter. I take a seat at her kitchen counter next to Christine, another employee. Christine offers me a cup of tea. Cecilia is animatedly showcasing two photo albums open on the table. I glimpse leafy landscapes and smiling young women. She is still wearing a simple black shirt and jeans. Thick silver rings flash as she gestures. Her dark hair is loose, her features striking. As she ignores me, I silently admire her remarkable beauty. Once I have her attention, her manner softens considerably. She moves to sit beside me and I look down at her from my stool. It feels distinctly unnatural to look down on Cecilia. I’d anticipated a vigorously practical approach to ethics, and was not disappointed. She evidently pays no mind to fastidious condemnations of private dealing, and seems angered by the impracticality of the idea. Of course artists should paint for private dealers when they travel. What Cecilia most often witnesses herself is what she terms ‘elder abuse’, a phrase I would hear again in Alice Springs: families using their older relatives as “the goose that lays the golden egg”. It’s a perversion of the Aboriginal culture of sharing which sees each pay cheque distributed upon arrival, a culture that dealers do not hesitate to capitalise on. For Cecilia, ethics is transparency. Warlukurlangu pays all its artists upfront. They must sign for it, so all is above board. Running a not-for-profit business, Cecilia has regulatory accountability and must provide all her financials to the Department of Arts and the Organisation of the Registration of Indigenous Corporations. After the artists’ cut, the remaining profits are poured into community programs. Gloria Morales, Warlukurlangu’s assistant manager, founded a program to keep the hundreds of dogs roaming the streets healthy. I had been informed that veterinary care and education about nutrition are not so readily available in similar communities. “Dead puppies everywhere” were Fiona’s precise words. The art centre was also instrumental in establishing Purple House, which provides dialysis treatment for the community’s many diabetes patients. It was a systemic problem I’d glimpsed in the swollen feet of several artists. In Yuendumu, Coke is cheaper than water and fresh produce is damningly expensive. Yet Cecilia’s greatest achievement, she declares, is the swimming pool. As for the industry’s ethics problem, Cecilia too is at a loss for a solution. Restricting who artists can paint for is paternalistic, but wrongdoers are nearly impossible to prosecute. In the end, she unknowingly echoes Sabine: artists must be willing and able to reject a bad deal. “Really it’s about education.” We both know that’s more complicated than it sounds. Finally, I ask about something that’s been nagging me. Sabine had expressed distaste for dealers dictating what colours and patterns artists should paint with. I’d witnessed Fiona doing just that since my arrival, gently but surely. I ask if that’s an ethical concern. After her reaction to the heinous Christmas decorations, I can guess her answer. We lapse into silence. Other guests have arrived, volunteers who are staying with Cecilia. Both she and the conversation visibly move on. I finish my tea and make myself scarce. As I traverse across town in pitch darkness, I muse on Cecilia’s abrupt manner. I like her terribly for it. When I return, our Dutch volunteer has made a coal pit and is preparing to roast a kangaroo tail, a delicacy in these remote communities. Instructing her is Rosie, an old Warlpiri woman who lived in Yuendumu before white people arrived. “Now, too many white people!” she proclaims with wry humour. Initially I mistake Rosie for one of the artists, though we’d met before. She cuffs me gently over the head. She sings for us, this motley assortment of white foreigners: French, German, Dutch, British, and Australian. It is a fire Dreaming song. In Warlpiri, she tells us, ‘warlu’ means not only ‘fire’, but ‘hot’ and all its synonyms. After two hours, the kangaroo tail is ready. We unearth it from the coal pit and break it apart with our hands. Though the weather had been unseasonably wet during most of my stay, all traces of cloud have fled before the harsh desert sun on my last morning. Outside the gates I run into Steven. He spots the camera hanging from my neck. I’m going to take photographs, I tell him. I follow him through an adjacent junkyard until we reach a small shed. He leans oddly against the side. I assume he’s about to take a piss, which I’d known him to do at the art centre, so I turn around and politely busy myself examining the dismantled car parts and rusted iron strewn across the grass. When I turn around Steven is standing in an open doorway that I’d somehow missed. A white man in a button-down shirt and workman’s boots sits behind him. Inside, a shelf in the corner bears an array of pointed rocks, their gleam muted by dirt. Boxes and crates are scattered across the floor. On top of a filing cabinet, a single dot painting is perched. Frank is something of a local character. He is the owner of the mining company and has lived in Yuendumu for 43 years. His son, he informs me more than once, is the only Warlpiri speaker working for Google. As Frank gives me his take on the clash of white and Aboriginal cultures I recognise a tone I’ve become familiar with: the staunch loyalty to what certain politicians might term ‘the Aboriginal cause’. Frank rustles through this cabinet and returns with a handful of coloured paper slips: the payslips of the artists from Warlukurlangu. He knows perfectly well, he says, that these remain largely undeclared. Artists feel no compunction whatsoever in collecting from Centrelink too, because every payment is distributed among family as tradition dictates. Eventually I thank him and take my leave. Only then do I notice his name sprayed across the entrance to his lair, heralding his presence. I spend my last hour at the art centre painting base coats on the dreaded Christmas decorations. An old woman with jet-black hair and silver roots, bent over an intricate dot painting, begins to sing softly. It is a simple, lilting tune, somehow familiar. Haltingly, I begin to hum an echo. I ask about the song. It is a sort of hymn they sing in church, once in Warlpiri and once in English. She suggests I join them one week. More than anything else, the prospect of a Warlpiri church service make me want to stay. I bring Steven a final cup of tea without being asked. I know how he likes it. He’s visibly touched. I walk through the community one last time. The streets are deserted. The fences are in varying states of disrepair. Quite often the view from the street resembles a junkyard. By our standards, this is surely poverty, as I had never seen it before. It didn’t engender despair, as I might have imagined, but contentment. I’d expected restlessness, but in Yuendumu people don’t seem to wish for a great deal more than they have. They simply wish for different things than I do. After dropping off the post and medical supplies, the bush bus rolls to a leisurely halt outside what the partially dismantled sign identifies as the YUENDUMU REGIONAL EATH CETRE. Eventually we pull away. Across the aisle, a woman with nails like talons examines her appearance in a broken mirror shard with as much scrutiny as any pageant queen. My last interview is with Karl Bajzic, one of the founders of Yubu Napa, an art dealership and gallery in Alice Springs. The door is opened by a disconcertingly tall man, wiry and grey-haired. He greets me warmly and guides me through the entry, paved with spotless grey tiles, to an office is piled with painted canvases. During our interview, Karl rifles through them every so often to illustrate a point. Yubu Napa was conceived first and foremost as an ethical business model. It opened seven years ago after the financial crisis had brought the industry heyday to a swift end. Here, artists are encouraged to paint in-house and chat with customers. It’s an excellent opportunity for self-promotion: visitors are far more likely to buy from an artist they’ve built a rapport with. Artists painting for Yubu Napa receive 40 to 50 per cent of the painting’s retail value. After the expenses incurred by running a gallery, Yubu Napa runs on a 10 to 15 per cent profit margin. Not too shabby for another industry, but in the art world it’s well below average. For these reasons, Karl is unable to compete financially with unethical dealers. You can walk into a gallery in Todd Mall, he says, offer to pay cash and barter to a quarter of the asking price. The dealer will still make a profit. “How much do you think the artist got?” he asks pointedly. Many of these galleries are members of the Indigenous Art Code, prompting Karl’s decision not to rejoin the association. Karl concludes, like Cecilia, Sabine and the Senate before him, that financial literacy is the only end in sight to artist exploitation. Lack of enforceable rules render both the AAAA and IAC impotent. I ask for a horror story. “Oh!” Karl exhales vigorously. I watch as dozens of heinous memories cascade through his mind. He visibly plucks one from its fellows. I leave him to wrap up the day’s business and take a turn around the gallery. I had set out from Sydney with no appreciation for Aboriginal art itself. The treasures of Warlukurlangu had changed that. Now I linger, drinking each painting in. The selection here varies widely at times from the typical dot patterns favoured by European buyers. Karl had wanted to give artists a chance to try their hand at different styles. The results are mesmerising. One stops me in my tracks. It is enormous; an abstract desert landscape of orange, purple and white, eerily similar to the one I’d left behind. The sand is the same shade of red. I’ve never seen anything like it. It’s also Karl’s favourite. As I wander back through the ghost town of Alice Springs after the tourist season, I stare hard through the windows of these art galleries. Canvases are stacked against the walls by the dozen, the same conventional dot patterns, what Karl called “textbook examples”, replicated again and again for white tourists. I’d put my last question to Karl tentatively. Should whitefellas deal in Aboriginal art at all? Karl, too, used to think not. Now, having sold only two pieces of art to Aboriginal customers in seven years of business, he sees an industry without white dealers as impracticable. One comment signalled a light on the industry horizon. “The consumer is becoming more educated,” he’d said, “and is asking the important questions.” I recalled Sabine’s impatience with customers asking about her race. I thought it was a fair question. To pose it requires a certain caution, an awareness of the ethical minefield this business can resemble. Yet certain words of the late Tiger Bayles had always followed me. They resurfaced now, unbidden: if you wait for a whitefella to change things, you’ll be waiting forever.